The roots of Jackson-based Malaco Records stretch back to 1961, when cofounder Tommy Couch Sr. began booking R&B bands at the University of Mississippi while serving as social chair of his fraternity, Pi Kappa Alpha. After graduation Couch moved to Jackson to work as a pharmacist and partnered with his brother-in-law, Mitchell Malouf, to form a booking agency, Malaco Productions. Couch’s fraternity brother, Gerald “Wolf” Stephenson, subsequently joined the agency, and it moved into recording in 1966. Around this time Malaco moved to its present location at 3023 Northside Drive. In their first years Malaco released few recordings, concentrating instead on leasing master recordings to other labels. One of the most notable—if untypical—sessions resulted in a 1970 Capitol LP, I Do Not Play No Rock ’n’ Roll, by down-home bluesman Mississippi Fred McDowell. The label gained momentum the same year via productions by New Orleans arranger Wardell Quezergue that yielded two major hits, Jean Knight’s “Mr. Big Stuff” on Stax Records, and King Floyd’s “Groove Me” on Malaco’s own Chimneyville label. “Groove Me” marked the beginning of a distribution and production arrangement with Atlantic Records, but the relationship ultimately did little for Malaco’s shaky finances. 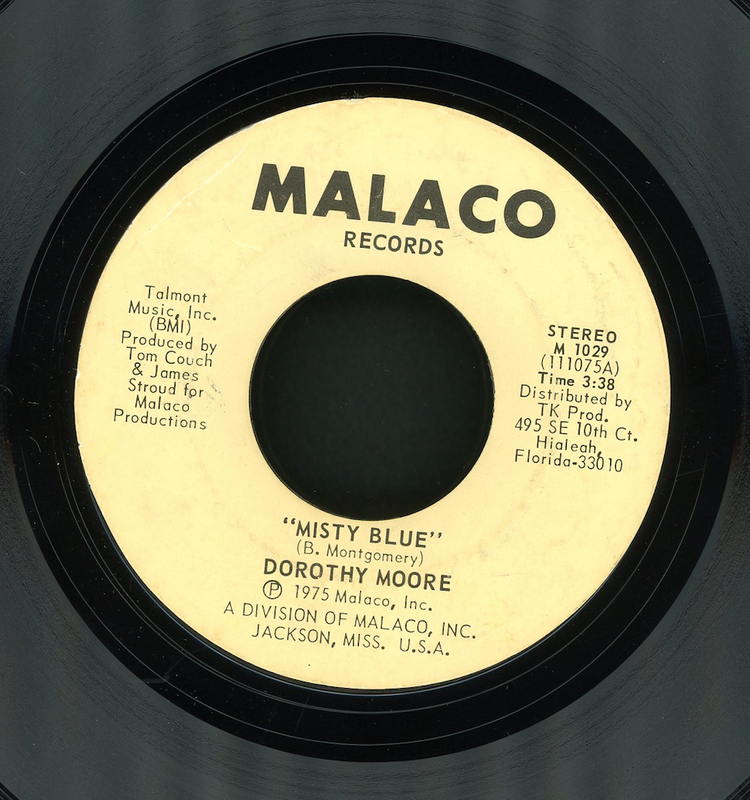 Salvation came in the form of Dorothy Moore, whose ballad “Misty Blue,” released on Malaco, reached the Top 5 on both the R&B and pop charts in early 1976. She subsequently scored many other hits for the label. The company finally found its niche in the early 1980s following the signing of Texan Z. Z. Hill, whose 1982 smash hit “Down Home Blues,” penned by Memphis–Muscle Shoals songwriter George Jackson, alerted the record industry to a seemingly untapped, mostly southern market for “soul blues.” Malaco’s eventual conquest of this market resulted from a number of factors: the hiring of veteran record promotion man Dave Clark; the development of a distinctive studio sound, aided by Malaco’s purchase of Muscle Shoals Sound in the mid-1980s; and a pool of talented songwriters, including Jackson, Larry Addison, Rich Cason, and Frederick Knight. In tandem with the rise of disco and the “urban contemporary” radio format, veteran soul stars including Denise LaSalle, Little Milton, Johnnie Taylor, Latimore, and Bobby “Blue” Bland lost major label contracts, and Clark helped bring them to Malaco. With these artists Malaco became the major force on the largely southern Chitlin’ Circuit, garnering impressive record sales but relatively little national attention. During the 1990s Malaco added veterans including Shirley Brown and Tyrone Davis, and Tommy Couch Jr., a University of Mississippi graduate and booking agent like his father, started the Waldoxy subsidiary, bringing aboard artists including Artie “Blues Boy” White, Carl Sims, Mel Waiters, Bobby Rush, and blues comedian Poonanny. The label has more recently signed many younger southern soul stars. Less well known but of great importance to Malaco’s prosperity is its gospel catalog. The label ventured into this market in the mid-1970s with the Jackson Southernaires and subsequently signed the Soul Stirrers, the Sensational Nightingales, the Williams Brothers, the Angelic Gospel Singers, and others. After purchasing the catalog of pioneer gospel label Savoy Records in 1986, Malaco became the leading gospel label, scoring hits with artists including the Mississippi Mass Choir, Rev. Clay Evans, Dorothy Norwood, and Rev. James Cleveland. Malaco’s offices suffered some damage when Hurricane Katrina hit in 2005 and were destroyed by a tornado on April 15, 2011. The company decided to rebuild and took the opportunity to refocus and strengthen its business, and Malaco continues to thrive long after better-known soul labels Motown and Stax have closed their doors. Peter Guralnick, Living Blues (January–February 1989). Jeff Hannusch, Rolling Stone (2 June 1988). MS News Now website, www.msnewsnow.com. Jacob Threadgill, Jackson Clarion-Ledger (February 6, 2016).